Look, Israel can determine for itself — it’s a sovereign nation — what’s in their interest and what they decide to do relative to Iran and anyone else. take out the nuclear program, militarily the United States will not stand in the way? The normal response from Biden would have been simply to repeat the administration’s standard position: we don’t expect Israel to attack, we wouldn’t countenance an attack, and beyond that we won’t engage in hypotheticals. But for some reason that’s not what Biden did, and the change in tone was pretty clearly in the direction of not standing in Israel’s way if they decide to do something. My guess: this is mainly intended to put a little bit of public pressure on Iran. 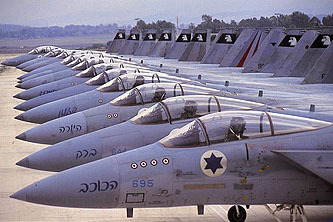 Everyone understands that Israel would have to overfly Iraq to get to Iran, and everyone understands that they could only do this with American permission — tacit or otherwise. Nothing has changed in this regard. America is plainly on the hook as a co-conspirator if Israel does anything, and always has been. Rhetorically, though, this amps things up. Biden is basically saying that Israel really might launch an attack, and the best way to avoid that is for Tehran to start dealing seriously with the United States. “If the Iranians respond to the offer of engagement, we will engage,” he said carrotishly — and if they don’t, well, there’s not much we can do to stop our crazy cousin. You know how he is. You’re better off dealing with us. Hard to say if this will work. But that seems to be what’s going on. This isn’t distancing, it’s pressure to quit screwing around and instead sit down and talk.